Digital signatures and certificates play a central role in software security. This article describes how to view the information that indicates when digital signatures and associated certificates are invalid. Use the following instructions to view certificate data associated with a digital signature to verify trustworthiness. Open the Word document, Excel spreadsheet, or PowerPoint presentation that has a digital signature. Double click the signature line. Note: If the signature line is not available, click the red Signatures button. The Signatures pane appears. On the signature name, click the down-arrow. Select Signature Details. The following image is an example of the Signatures button. The Signature Details dialog appears. For more certificate information, click View. On the Certification Path tab, you can identify the certificate root and certificate status. 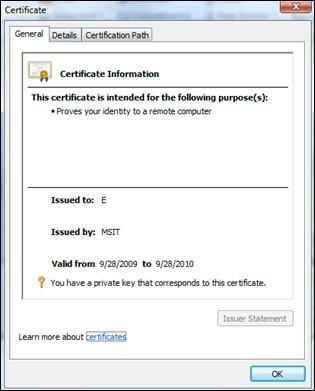 The following image is an example of the Certificate dialog. A trustworthy signature is valid, on the user account, on the computer that states it as valid. If the signature were opened on another computer, or another account, the signature may appear as invalid because that account may not trust the certificate issuer. Also, for a signature to be valid, the cryptographic integrity of the signature must be intact. This means that the signed content was not tampered with, and the signing certificate is not expired or revoked. The digital signature is corrupt because its content has been tampered with. The certificate was not issued by a trusted certificate authority (CA), For example it might be a self-signed certificate. If this is the case, you must choose to trust an untrusted issuer to make the signature valid again. The certificate used to create the signature has been revoked, and no time stamp is available. 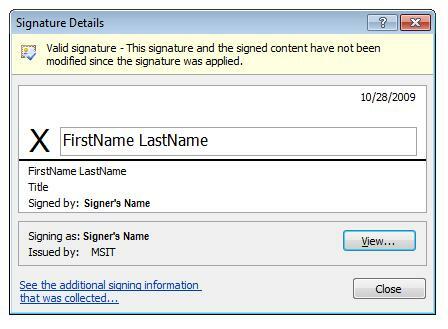 The following image is an example of the Signatures pane with an invalid signature. Open the file that contains the digital signature that you want to view. Click the File tab. The Microsoft Office Backstage view appears. Click the Info tab, then click View Signatures. The Signatures pane appears. In the list, on a signature name, click the down-arrow. Select Signature Details. The following image is an example of the Signature Details dialog. Contact the signer, and let them know that there is a problem with the signature. Inform the system administrator in charge of your organization's security infrastructure. We advise that you do not lower your security level settings. You can Add, remove, or view a trusted publisher. The veifier is offline (disconnected from the Internet) therefore making it impossible to check certificate-revocation data, or to verify time stamps if they are present. The certificate used to create the signature has expired and no time stamp is available. The root certificate authority who issued the certificate is not trusted. 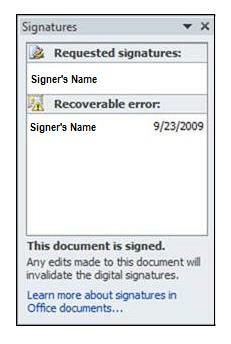 The following image is an example of the Signatures pane with a recoverable error. Important: If you experience a recoverable error, contact your system administrator, who may be able to change the signature's state to valid. 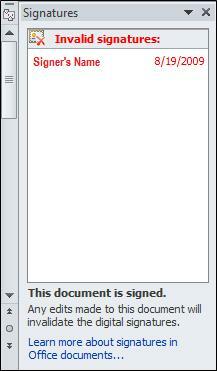 In Office 2010, a valid digital signature signs certain parts of a file. However, you can create a signature that signs less than the parts required. This partial signature is cryptographically valid. Office can read these signatures. However, they are likely not created by an Office program. If you encounter a partial signature and are unsure about how to continue, contact the IT administrator to help determine the origin of the signature. Authenticity The digital signature helps to assure that the signer is who they claim to be. Integrity The digital signature helps to assure that the content has not been changed or tampered with since it was digitally signed. Non-repudiation The digital signature helps to prove to all parties the origin of the signed content. "Repudiation" refers to the act of a signer's denying any association with the signed content.